The Earth-2 plot returns in an overstuffed but enjoyable episode. DR. LIGHT HAS A VIBE ABOUT ZOOM. The Flash seems to be more and more concerned with world-building as of late, with both this episode and “The Fury of Firestorm” devoting time to introducing and developing new characters from the comics. “Firestorm” pumped the brakes on the Earth-2 plot, but “The Darkness and the Light” returned to it with a vengeance, pushing the story forward and shifting the dynamic of Team Flash yet again. 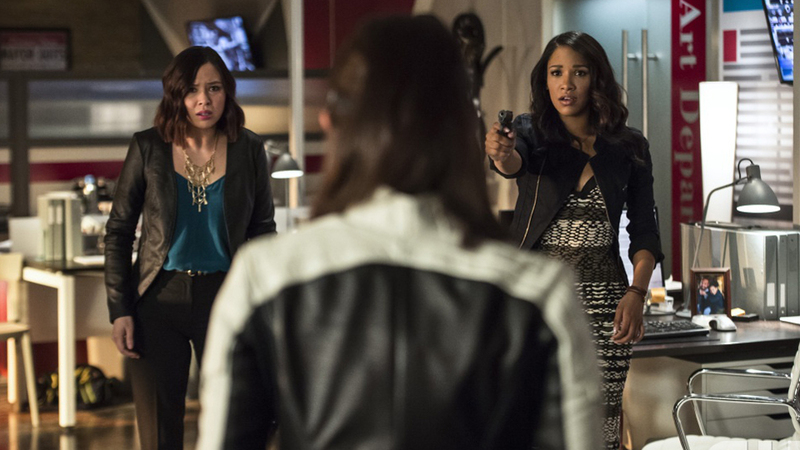 Following up on last episode’s big reveal of Harrison Wells saving Barry from King Shark, this episode sees the Dr. Wells of Earth-2 (passive-aggressively dubbed “Harry” by Cisco) offer to help combat the threat of Zoom and his lackeys. This, naturally, doesn’t sit well with Jay Garrick, whom is none too fond of Harry’s Lex Luthor-esque practices. When a new meta called Dr. Light appears, it’s Jay vs. Harry as they attempt to see who can stop her first. Meanwhile, Cisco is still having visions of the future, and Barry continues his wonderfully offbeat relationship with Patty Spivot. It’s a testament to the episode that it has almost as much, if not more going on, than “The Fury of Firestorm,” yet still manages to sneak a few moments of brevity amidst the dire circumstances of seeing Wells, or at least a version of him, alive and well. Tom Cavanaugh really gets to show his strength as an actor here as well, as it’s not many people who could find a way to play the same character in such a different, yet still familiar way. While it’s hard to say that anyone was clamoring for the character to return, it’s good to see that Greg Berlanti and co. aren’t simply rehashing Season 1’s wonderful villain. That said, the rest of the episode is less successful, with Dr. Light being another villain sent from Earth-2 with express instructions to kill Barry, except the twist is that she’s actually Barry’s ex-girlfriend, Linda Park. While this would normally be an interesting reveal, the show doesn’t do much at all with the premise and the conflict with Dr. Light ultimately fizzles. That’s not to mention that even though this episode shows more of Zoom, the show still hasn’t built him up as anything more than a puppet master. There was one bright spot, of course, in the scenes of Barry and Patty. While this particular story was almost sitcom-worthy, Grant Gustin and Shantel VanSanten have such great chemistry, and any scene they’re in is a joy to watch. “The Darkness and the Light” is an enjoyable episode, as Flash episodes usually are, but it does show that the series can sometimes bite off more than it can chew, with an overstuffed plot that introduces yet more supporting characters while leaving the villains sadly undercooked. It’s great to see the show broaden its horizons, but it needs to be careful it doesn’t come at the expense of the smaller details. What did you think of Wells-2? Is Zoom a worthy archvillain? Tweet me @MaxMielecki. And be sure to follow us @YouNerded.